The European Commission on Wednesday took new legal steps to sanction Poland over disciplinary measures introduced for judges. It is the third infringement procedure the EU has launched against Poland over reforms to the judiciary since 2017 as it struggles to contain what it sees as a weakening of the rule of law in eastern European member states. 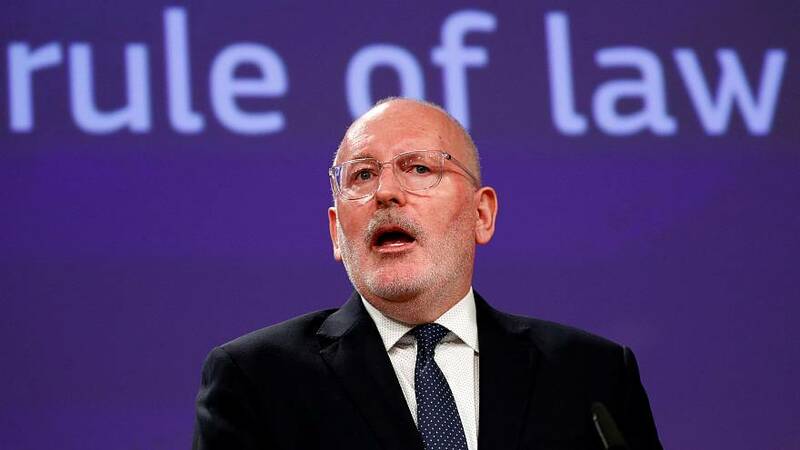 The Commission's First Vice-President, Frans Timmermans, said Poland's new rules for the judiciary undermines the independence of judges "by not offering necessary guarantees to protect them from political control. Since coming to power in 2015, Poland's ruling Law and Justice party (PiS) has sought to overhaul the judiciary through a number of measures. One of those allows for judges to be sanctioned for their judicial decisions by the Disciplinary Chamber of the Supreme Court, whose members are now appointed by the Polish parliament. This includes decisions to refer cases to the European Court of Justice, which could create a "chilling effect" for judges making use of the mechanism to defend themselves. "The Union's capacity to uphold the rule of law is essential, now more than ever," Timmermans said. "First because it is an issue of fundamental values, a matter of "who we are". Second, because the functioning of the EU as a whole depends on the rule of law in all member states," he added. The Polish government now has two months to reply to the Commission's complaints. Euronews has reached out to the Polish government for a statement. Wednesday's infringement procedure is the latest in a series of measures the EU has taken since 2016 against Polish judicial reform. It launched a dialogue with Polish authorities in January 2016 but lack of progress saw the EU launch a first infringement procedure in July 2017 for a law lowering the retirement age of judges and giving the Justice Ministry the authority to dismiss and appoint Court Presidents. Five months later, the EU referred the case to the European Court of Justice and then took the unprecedented step of triggering Article 7 — the EU's punishment clause dubbed "the nuclear option." Another infringement procedure followed in July 2018, this time over a law that could force Supreme Court judges to retire and which saw the European Court of Justice impose interim measures to stop the implementation of the law.